Homes for sale in the Park Hill Neighborhood in Denver below. The article by MARGARET JACKSON in Confluence Denver reads: The longstanding neighborhood in northeast Denver is seeing a boom in development that spans housing, schools and community services and even an upcoming art trail. While commuter rail is on the way, increasingly thick traffic on Colorado Boulevard remains a big challenge for Park Hill…. That rail stop DelZotto heard about will be a reality when the Regional Transportation District opens the University of Colorado A Line, which will operate between Denver Union Station and Denver International Airport beginning in April 2016. Park Hill Village is just two stops from Denver Union Station…. A charter elementary school opened this fall in Holly Square, an area long known for its gang activity…. 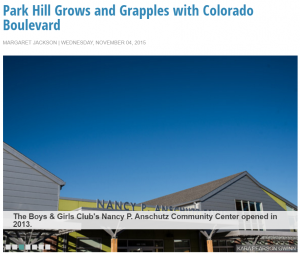 The Boys & Girls Club’s Nancy P. Anschutz Community Center opened in 2013…. ULC also is leading an effort to connect the Park Hill neighborhood to the A Line through an art-themed trail. 303 ArtWay will feature art commissioned by the community and provide a platform for activities such as parades and group bicycle events…. At 3,021 acres, Park Hill is Denver’s largest original neighborhoods, with about 66 percent of its land mass devoted to residences. It’s also one of its most diverse, both culturally and economically. See the full Denver Real Estate News Article from Confluence Denver. Park Hill Grows and Grapples with Colorado Boulevard, by MARGARET JACKSON at http://www.confluence-denver.com/features/park_hill_110415.aspx.